Offers dark green, aromatic foliage and a plethora of larger-than-average yellow blossoms. Starts blooming Late September in the North and Mid October in the South. All our 'Amiko Yellow' Chrysanthemum Plants are grown and shipped in fine quality growing medium. They are guaranteed to arrive alive and ready to plant. Comment: Just received my new Amiko mum. Even though it was over 5 days in shipment, my order of 6 mums all arrived healthy and in excellent shape. I just planted them in 30 barrel-like pots, surrounded by already existing annuals. I look forward to beautiful plants. Will advise later and send picture after they grow. Comment: I have never received such good quality at arrival of plants being shipped. Not only were they bright and green (no yellowing from transport) but they we packaged very carefully, each and everyone. I placed them out side and watered them until I could plant them 3 days later. They are doing great. Thank you!!!! 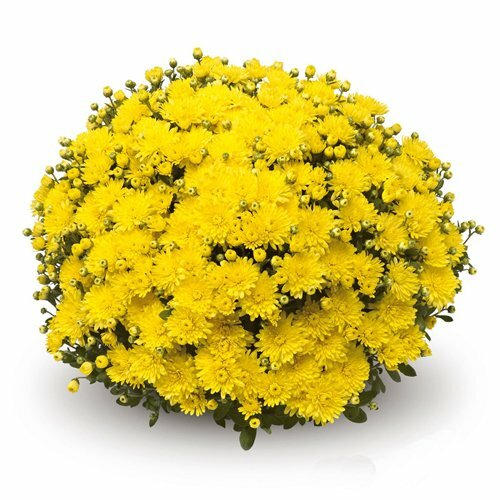 "Amiko Yellow Belgian Chrysanthemum Plant"
Comment: Plants arrived in beautiful shape and at just the right time to plant.